20 oz. Tumbler will keep your beverage hot or cold. The tapered design will allow for a great fit into your vehicle's cup holder! We have three amazing color options, White, Matte Black or Stainless. 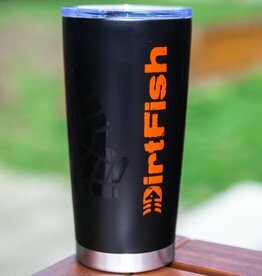 All colors have our DirtFish logo double printed loud and proud in our signature orange. 20 oz of iced or hot coffee! Yes Please! !